The standard of eddy current crack detection for production and laboratory. Digital eddy current test instrument for one channel nondestructive testing of metal components, including mass produced parts and semi-finished products for cracks, pores and grinder burn according to the Preventive Multi-Filter Technology (PMFT). The new ibg-family of digital crack detection instruments offers for the first time a simultaneous 100% inline detection of grinder burn and cracks in your production lines. Due to automatically generated 360° tolerance zones, testing over 30 simultaneous band passes and ibg’s own good-part-referencing you will also find defects which conventional instruments with defect-oriented calibration will miss. 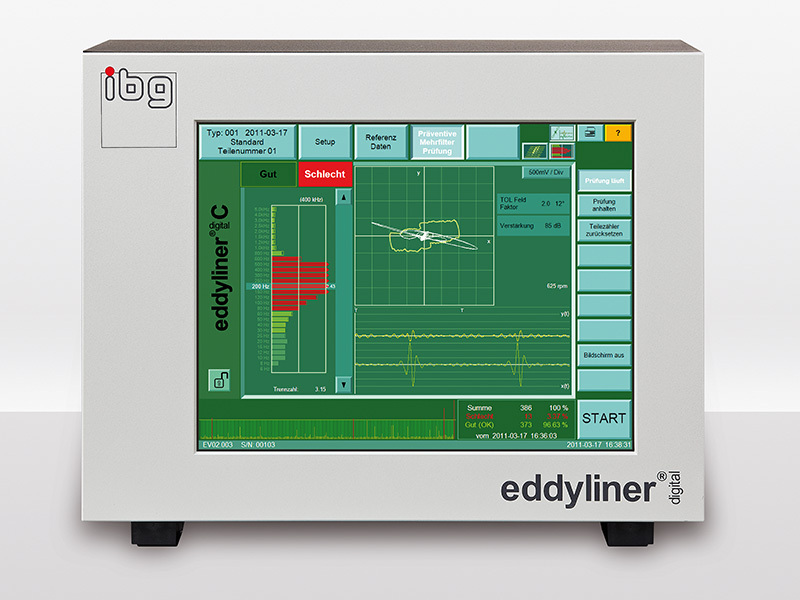 The eddyliner digital C distinguishes itself with compact design and concentration on one channel crack and grinder burn detection with one probe and combines that with the well known ibg test reliability and ease of operation. The ergonomic interface enables correct and simple operation via touch screen. All functions and test results are captured at a glance. 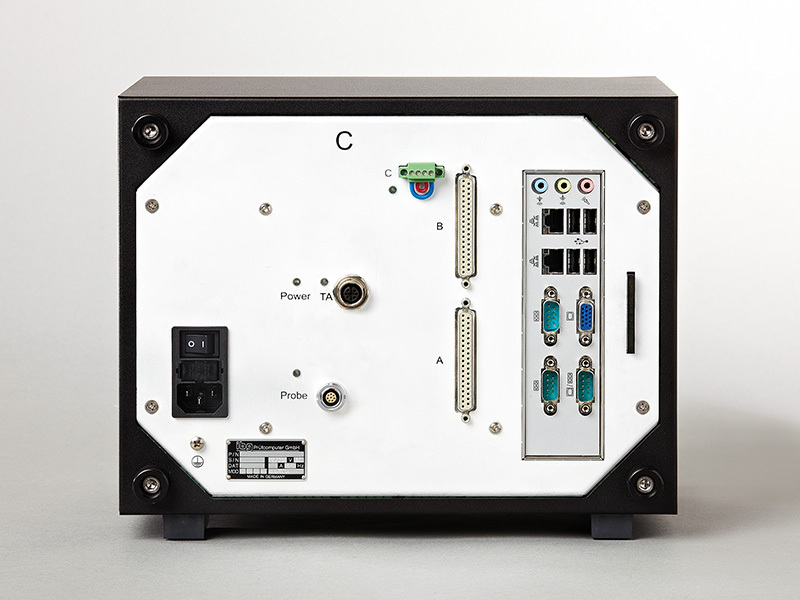 Digital processing of the measuring signal with unique processors, immediately after the pre-amplifier guarantees the greatest possible stability of test results. The eddyliner is based on the ibg system concept proven for decades. 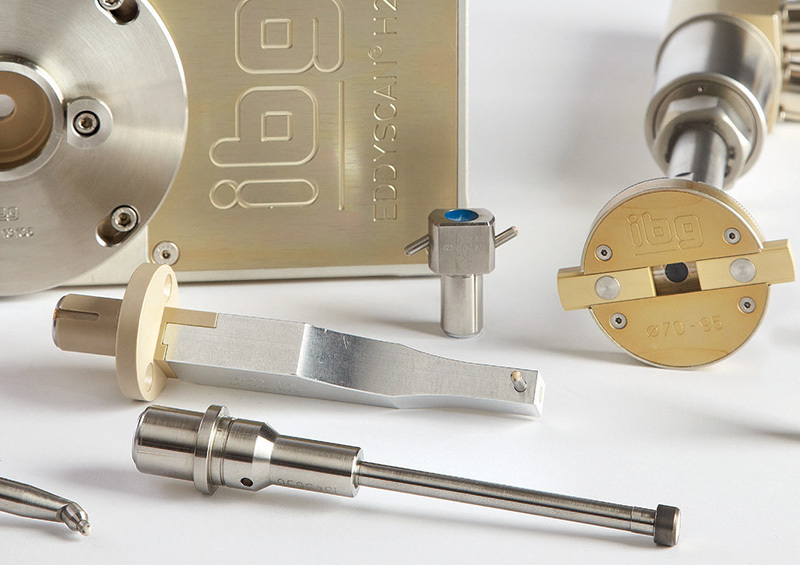 All probes and rotating heads of the ibg system family can be used. The eddyliner is therefore recommended not only for the solution of new tasks but also as an upgrade for existing production machines to be equipped with state-of-the-art eddy current technology. Up to now, competitive instruments require sophisticated and time-consuming manual determination and setting of suitable filter band, phase angle and gain. We replace that by the ibg exclusive development of Preventive Multi-Filter Technology (PMFT) with automatic tolerance zone creation. This quantum leap in the eddy current technology, unique to ibg worldwide, establishes a new standard for quality in crack and grinder burn detection. During material data recording (calibration) with PMFT, surface areas of several good parts are scanned, and the good surface eddy current “noise“ is recorded simultaneously in each of 30 band pass filters. Tolerance zones, enveloping 360 degrees, are automatically created within each filter band, capturing the allowable eddy current “noise“ from good parts. The eddy current signals of good parts are the result of surface roughness and material properties. Thus, the thirty tolerance zones store the part specific fingerprint of the good parts. Additionally, edge effect, hardness profile run out, eccentricity, etc. of the good parts are calibrated during material data recording. Pseudo rejects are, therefore, reduced considerably without losing visibility to real flaws. Real flaws are now automatically detected no matter their frequency content or phase angle content. Even unexpected fl aws that can be detected by eddy current are reliably detected. This unique “good-part-only-concept“ enables setup within a few minutes. Simply record an adequate number of good parts. One keypress switches to Preventive Multi-Filter Test and testing can start. That‘s all! A variety of crack detection probes are available with different scan width, sensitivity and design. Customised models for special applications are designed and manufactured in house. Our compact and precision rotating heads eddyscan H and eddyscan F, operated with our eddyliner, can be the solution for cycle time optimised crack tests. Monitoring of probe cable break guarantees maximum reliability for continuous operation. Eccentricity of a workpiece can be offset electronically thanks to lift-off compensation. This function requires special lift-off compensation probes. parts are fi rst recorded and afterwards cross checked in the laboratory. If it turns out that some assumed NOK parts need to be added to the reference parts it is just a matter of one keystroke. The suspend function enables areas on components such as holes not to be tested. 50 part types with all settings and reference data can be stored in the device memory and switched manually or via PLC for automated processes. Test results are shown as bargraph, xy-diagram with tolerance zones, x(t) and y(t) or three-dimensional C-scan, selectable. The C-scan (or cascade diagram) provides a plannar display of a cylindrical surface to enable visualisation of defect position and length. The carrier frequency is selectable within a range of 3 kHz and 10 MHz in 21 steps. The filter frequencies of the 30 band pass filters are spread in the range 6 Hz – 5 kHz. Test results, part types and device settings are stored internally on a robust flash memory and externally on an USB stick. Test results may additionally be logged via Ethernet. A ring buffer logfile records all actions and allows fast debugging for service purposes. Start of test manually at the touch screen, via PLC or an optional start button. The eddyliner is remotely operable by every network computer via VNC viewer software. The instrument provides a multilevel access authorisation concept that operates by pin code. The user always has access to a context sensitive help function on the device screen which often renders a look into the manual unnecessary. Included are: German, English, Spanish, French, Italian, Czech, Polish, Portuguese, Chinese, Hungarian, Japanese, Korean and Russian. Other languages as option. XVGA interface allows connection to a monitor or projector, an essential feature for training courses. XVGA PXVGA interface allows connection to a monitor or projector, an essential feature for training courses.